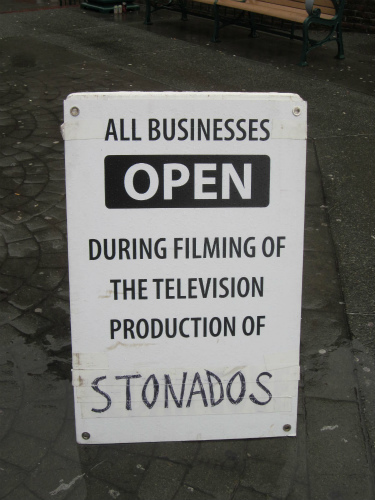 If you can’t wait for Sharknado, don’t fret, there is another tornado combo-pun title film popping up on SyFy April 27th with Stonados! Stonados is a disaster flick about a giant tornado that throws stones at everything in its path. Finally the true story of the tornadoes that haven’t sinned and thus can begin the stone-throwing armageddon Jesus talked about in the Bible! Experienced disaster film helmer Jason Bourque directs (Seattle Superstorm, Wildfire 7: The Inferno, The Two Coreys) and SyFy movie writer superstar Rafael Jordan wrote the script. You know his work: Dragon Wasps, Frost Giant, Star Runners, Hammer of the Gods, and the upcoming masterpieces Poseidon Rex, Jurassic Attack, and the new classic I just heard about, Ragin Cajun Redneck Gators! It stars Paul Johansson (One Tree Hill) as Joe, a widowed ex-storm chaser; Sebastian Spence (First Wave) as his former partner; Thea Gill (Queer as Folk) as a tough bureaucrat; and William B. Davis (The X-Files), as a lighthouse keeper. Also featured are rising local stars Jessica McLeod (The Christmas Consultant) as Megan, Joe’s rebellious teenage daughter; Dylan Schmid (Once Upon a Time) as Jackson, her younger brother; and Grace Vukovic (Mulligans) as their friend Julie. Everyone had a great time on set and many got to experience movie magic with huge wind machines simulating the storm and big chunks of Styrofoam “stones” flying around set! Here are a few snapshots of some of our members on set! How powerful can the Stonado be if it can’t shut down Dave’s Java Hut?